I have noticed a very common thread while working with clients with gut issues. Most of my clients struggle with depression, anxiety and mood swings. This connection is not a coincidence. I personally was depressed on and off during the peak of my gut issues. I was weepy and apathetic. My world felt like it was falling apart. I also felt very quick to anger as well. The connection between your mental health and the gut is well known even in the conventional medicine world. However, the connection is often misinterpreted. Conventional docs believe your depression or anxiety drives your gut symptoms. This conventional view is short sighted. It fails to see the relationship between the brain and the gut as a two-way street. The ecosystem in your gut will have effects on how you think, feel and act. This model leads GI docs to tell you that your gut symptoms are “all in your head”. Makes my ears steam just thinking about this being suggested to patients. Many of the conventional docs prescribe antidepressants to patients with IBS or SIBO, because they feel like gut symptoms are psychosomatic. But, this approach fails to address the complexity of the bi-directional brain-gut connection. The conventional system also views depression and anxiety as life long conditions that you have to manage with drugs. A depressed or anxious mind is broken and chemically imbalanced. She goes on to describe how depression is one of the few diseases that has a subjective diagnosis. You are labeled based on the doctor’s opinion of your symptoms. By being labeled as depressed or anxious by a doctor, it can take away your power and agency. Instead of viewing depression as a sign that something is off, you can feel like your brain is broken and you need to be on medication for the rest of your life. But, you are more than your depression and/or anxiety. By focusing in on the gut and repairing your microbiome, many of these mental health symptoms can start to fade away. “The most powerful path to our brain—and peace of mind—is through our gut,” writes Dr. Brogan. How can little microbes in our gut effect how we think and feel? Enter the cytokine theory of depression. “Depression is often an inflammation-driven condition, not a neurochemical deficiency disease,” Dr. Brogan writes. SIBO and other gut imbalances drive this inflammation that influences our mental health. Let’s break down how gut inflammation drives brain inflammation leading to depression, anxiety and mood swings. Evidence to support the cytokine or inflammation theory of depression is over powering the popular and myopic serotonin theory of depression in the scientific literature. Let’s explore this cytokine theory of depression. It all starts at the gut barrier! Your gut lining is the interface of your whole immune system. Our gut is the sole barrier from the outside world! The integrity of the gut determines what is actually being absorbed into the body and blood stream versus what is kept in the GI tract and excreted. 80% of our immune system resides in our gut to protect us from pathogens and foreign materials. The immune cells in the gut are not only working locally, but they communicate to other immune cells throughout the body. What you are exposing to the gut environment (food, chemicals, stress etc) will program your immune system for better or worse. Microbes are crucial to creating a strong intestinal barrier and toning the immune function in the gut. If you have imbalances or pathogens in your gut microbes, your gut lining can become permeable or leaky. Gut bacteria can produce endotoxins called lipopolysaccharides (LPS). It is found in the cell wall of many bacteria. If the gut barrier is strong, it does not enter the blood stream and instead remains in the interior of the gut. LPS when it remains in the GI tract can actually be helpful in toning the immune system, but when the gut is permeable endotoxins can leak into the blood stream prompting a powerful inflammatory response. The immune system is triggered and increases production of chemical messengers called cytokines. These inflammatory messengers kick off the immune response systemically. These cytokines will trigger brain inflammation. In addition, LPS can directly cross the blood brain barrier producing an inflammatory response in the brain. The cytokines and LPS will activate microglial cells in the brain. Microglia cells are the brains immune soldiers that are meant to protect the brain from foreign invasion. Once activated, the microglia produce more cytokines creating more brain inflammation!! Overactivation of microglial cells will result in brain tissue damage, neurodegeneration and poor mental health. To compound matters, brain degeneration will blunt activation of the vagus nerve and further impair gut function. It becomes a vicious cycle of gut inflammation leading to brain inflammation which will increase gut inflammation! As Dr. Brogan points out in her book, elevated cytokine levels have been shown to be predictive of depression. Individuals with major depression have been also found to have elevated levels of LPS in their blood. A great example of how gut inflammation can lead to brain degeneration can be pulled from studies looking at brain lesion formation in inflammatory bowel diseases. Dr. Datis Kharrazian points out in his brain book that 42% of patients with Crohns and 46% of patients with Ulcerative Colitis had white matter lesions (tissue damage)in the their brains. Yikes! Its not surprising that research finds higher rates of depression and anxiety in IBD patients. One study even demonstrated that depression and anxiety seem to precede the IBD diagnosis and could potentially be used as a risk factor for the disease. Even if you don’t have IBD, you could still have inflammation in your gut that is driving systemic inflammation and mental health decline. The Standard American diet can drive leaky gut through two main mechanisms. First, the SAD is very low in fermentable fibers. Fermentable fibers are crucial for building a healthy microbiome and building a strong intestinal barrier. A diverse microbiome is critical to maintaining the tight junctions between the cells lining the gut, which ensures gut lining integrity. Not enough fiber can also change the pH environment of the gut, making it a more ripe environment for pathogenic or opportunistic overgrowths. Second, the SAD is overflowing with inflammatory processed foods that drive inflammation in the GI tract leading to leaky gut! Gluten, refined seed oils, pesticide especially glyphosate and GMOs can all add fuel to the intestinal fire. A whole foods nutrient dense diet filled with fermentable fibers (that you can tolerate) is key to reducing the inflammation in the gut. Sometimes in the SIBO world, low fiber diets are continued long term and this can hinder the diversity and growth of your microbiome. Depletion of good gut bugs and diversity will negatively impact your mental health. If you do go on a restricted fiber diet like Low FODMAP, I would have a plan in place to reintroduce foods. Another potential factor in how SIBO and other gut imbalances can drive mental health symptoms is the development of nutrient deficiencies. Pathogens and gut imbalances can disrupt digestion and absorption of nutrients. Certain pathogens and microbes can also steal your nutrients to fuel themselves especially B12 and iron (pesky thieving bugs). 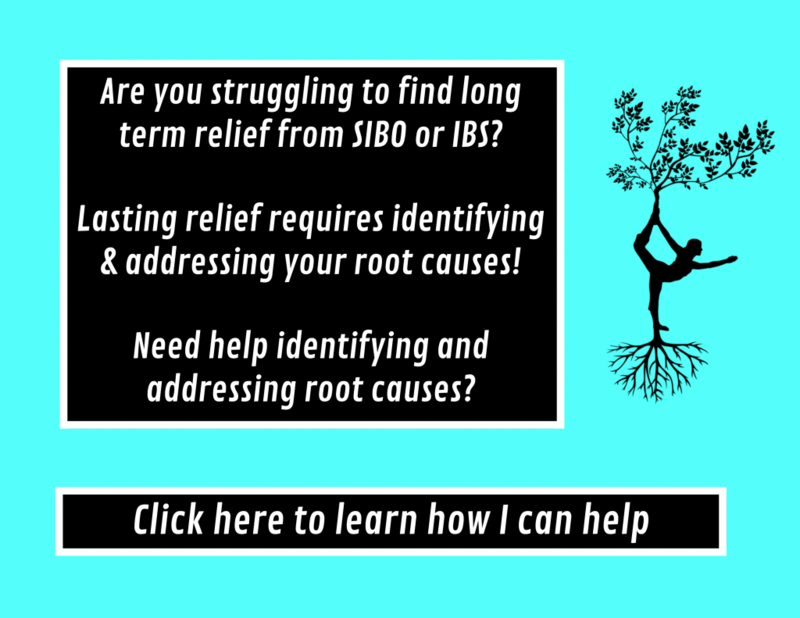 Due to bacterial thievery, it is no surprise that many SIBO patients are deficient in iron and B12. Deficiencies in B12 and iron can lead to depression, anxiety and poor mental health. Because SIBO causes fat malabsorption, fat soluble nutrients can also become depleted. Vitamin D deficiency is associated with depression. In addition, I see restrictive diets for SIBO leading to deficiencies that can exacerbate mental health symptoms. Nutrients are needed to maintain the protective mucous layer and the integrity of the gut lining. I describe this in depth in this post. Kiran Krishnan, a microbiologist and gut health experts, has pointed out that secretory IgA levels also fall on a restrictive diets. Secretory IgA is an antibody found in the mucous layer above the gut lining that serves as the first line of defense in protecting us from toxins and pathogenic microorganisms that we consume. To maintain a good level of secretory IgA, you need adequate levels of zinc, selenium, vitamin C, choline, glutamine, glycine and omega 3 fatty acids. When IgA becomes low, bacteria, toxins and food will bypass the mucosa and kick off inflammatory processes in the gut. The immune cells in the gut lining essentially think they are under attack and this chronic over stimulation of our immune system can lead to both immune and gut barrier dysfunction. As I discussed earlier, once that gut inflammation starts and that barrier starts to breakdown, brain inflammation will also result. Making sure you are nourishing your body and supplementing accordingly will play a key role in keeping that gut barrier and mental health strong. Gut inflammation can cause hormone imbalances that can lead to depression. LPS and inflammatory signaling in the gut will raise cortisol levels. High cortisol levels totally derails digestion as I laid out in this post. To make matters much worse, thyroid hormones can also become imbalanced driven by gut inflammation. High cortisol levels and inflammation will prevent the conversion of the inactive thyroid hormone (T4) into the active thyroid hormone (T3). Low T3 levels are very common in those with gut imbalances. Depression is a well-known symptom of low thyroid hormone levels. Neurotransmitters are chemical messengers that communicate signals from one nerve cell to the other. They play a role in how we think and feel. The enteric nervous system found in the gut produces and uses over 30 different neurotransmitters. Bacterial balance seems to be an important player in neurotransmitter production. Low levels of the neurotransmitter serotonin is commonly linked to depression. Serotonin is considered our “happy” feel good neurotransmitter and leads to a calm/relaxed feeling. The serotonin theory of depression is very short-sided because it neglects the role of inflammation in the depression model, but it is still important to have a healthy level of serotonin for good mental health. 90% of the body’s total serotonin is produced in the gut. Your intestinal environment and microbes play a key role in your ability to produce serotonin. This connection was discovered in mice studies that showed a 60% reduction in serotonin production in mice bred without gut microbes compared to conventionally raised mice with gut microbes. Further research has shown that certain gut bacteria produce metabolites that interact with the cells in the gut to promote serotonin production! What can you do about to help better your mental health? Good mental health starts with a good gut. If your gut is on fire, your brain will also be on fire! Reducing inflammation in the gut should help with depression, anxiety and mood swings. Need help repairing your gut health? Work with Me! Contact me to set up a free 20 minute consult to see if we make a good fit! Next Next post: Are food fears preventing your progress?